Do you like Hexa Fever 2? Share it with your friends. Hexa Fever 2 is the second part of a very catchy logical game where you can look forward to a large portion of brand new levels. 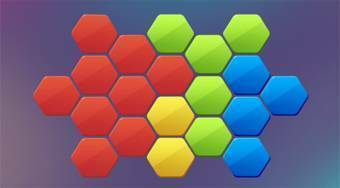 In each round, your task will be to place objects of colored hexagons on the board so that all the dark boxes fill them. If you do not know the advice, you can use the help by clicking on the bulb symbol at the bottom of the screen.